Here is another tasty quinoa recipe! 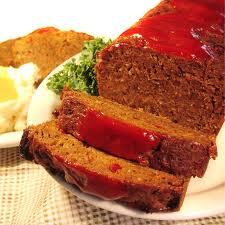 This should be a likeable recipe for those that think traditional meatloaf is too heavy. Quinoa is used in place of bread crumbs allowing the loaf to be less dense. The recipe calls for ground turkey, but if you want to choose the healthiest option make sure you buy ground turkey BREAST. Just like chicken, there is white meat and dark meat in turkey, and white is the leaner option. I like to serve this with roasted red potatoes and fresh green beans. Southern-style taste without a Southern-style waist!